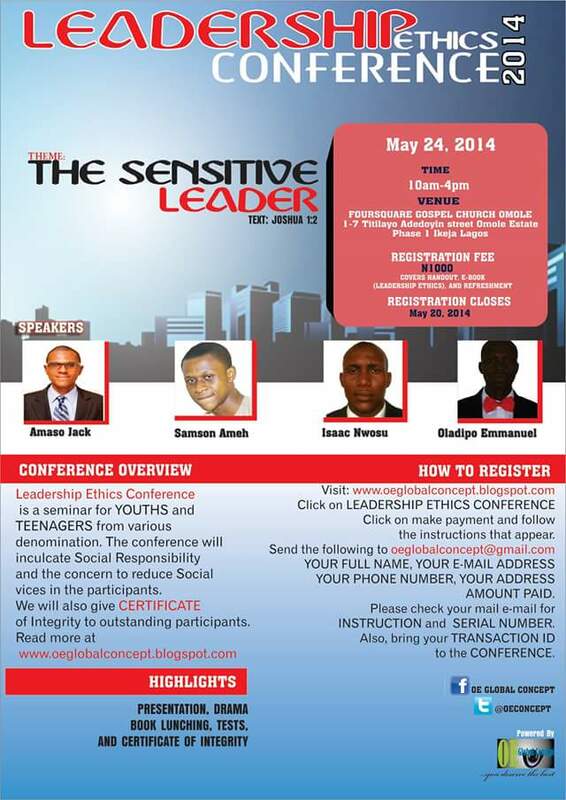 OE Global Concept introduces her maiden edition of Leadership Ethics Conference, holding on May 24, 2014, at Foursquare Gospel Church,1-7, Titilayo Adedoyin Street, Omole Estate, Phase 1, Ikeja Lagos. of integrity at the Leadership Ethics Conference based on their performances in the Quiz Competition. The certificate of integrity warrants the receiver to use OE Global Concept as Referee, as well as, using the certificate as additional document in Job CV. Before a participant qualifies for the certificate, s/he will have to contest for an entry in which only the 1st 100 candidates to send in correct answers for the questions asked would pass to the next stage. The 2nd stage and the 3rd stage until the 1st 20–positions are picked would be written test based on the conference presentations, magazine publication, the Bible and the book published (leadership ethics): Our publication, Hierarchy Magazine is published into PDF – whoever needs it will subscribe, freely, for it by visiting www.oeglobalconcept.blogspot.com. To create the spirit of self-sacrifice (to bring positive changes to the society) in the participants. accountability, knowing that any mis-representation of OE global Concept amounts to withdrawal of the certificate, permanently. To support those who may be looking for jobs but need standard referee to support their cover letters. To work with our sponsor without any charges in getting qualified candidates for available positions. REGISTRATION: N1, 000 (covers e-book, hand-outs and refreshment). Oladipo Emmanuel Olayinka is the President/CEO of OE GLOBAL CONCEPT: He studied Mass Communication, from the Nigerian Institute of Journalism, Lagos. Oladipo is an ardent and consummate writer; orator in youths and teens seminars/conferences. He loves people and always wants to have them around him. Oladipo Emmanuel believes in the electronic future of journalism with multimedia platform and currently runs an e-Publishing Company, which caters for the young ones (youths and teenagers), to address the abnormalities in the society and encourage godliness and productivity, in young ones. He holds a National Diploma in Mass Communication and has a Bachelor of Theology, B.Th. (in Missions), and a Bachelor of Science, B.Sc, (in Peace and Conflict Resolution), concurrently, from the Foursquare Gospel Church’s seminary in Nigeria, and the National Open University of Nigeria in view. Samson Ameh is the President and Visionary of the 21st Century Revolutionary. He is also the Founder and CEO of Tinkgen Management and Development Company. Samson is on the advisory board of the following organisations: Eagles Forum, 2moro Event World Company, Goody Daycare and Sam-ah Consulting. He was among the young 15 Nigerians that planned, publicised and executed the maiden edition of Fela Durotoye’s GEMSTONE GLOBAL READING FESTIVAL which took place in 17 cities in Nigeria and 17 other countries in the world. He is currently connected to over 100 NGOs within the country. A motivational speaker, concept developer, organisational chart developer, consultant, event planner, project management expert and nation builder. Pastor Isaac Nwosu is a teacher of God’s word, an assisting minister in Foursquare Gospel Church Omole, Ikeja District Headquarters and member of Foursquare National Ministerial Council. He is the current Zonal Treasurer of District Headquarters’ Zone (Omole Zone). Pastor Isaac Nwosu leads JESUS SAVESnMINISTERS, an Interdenominational Fellowship, which attracts Christians of all backgrounds to reach out to Souls, especially in Hospital, Motherless Baby Homes, Police Stations, etc. He is an itinerary teaching evangelist, whose teaching ministry has been of great impact to the body of Christ in Lagos, Nigeria. He is the Executive Secretary, Foursquare Gospel Church Missions Board in Nigeria. Isaac Nwosu is a young theologian with a Bachelor Degree in Biblical and Pastoral Studies and a Master of Arts Honour in Leadership and Church Administration; a certified member, Nigerian Institute of Management and graduate of Advance School of Leadership for future studies. Pastor Isaac Nwosu is the Managing Director, Ambassador Hephzibah Services Enterprises. Amaso Kaizer Igoye Jack was born again in 1986 while attending Federal School of Arts and Science, Victoria Island, now Kings College extension. He hails from Abonnema, Akuku Toru, Rivers State, Nigeria, and is not yet married. Jack, an ordained minister of the Lord, Jesus Christ, with the Redeemed Christian Church of God, is also an ordained deacon in the year 2000 but prefers to be addressed as Brother. His local assembly is Amen Tower, Area Headquarters, Lagos Province. His passion lies in PUBLIC SPEAKING and WRITING, but also engages in BUS EVANGELISM, which he started since 1996 till date and FACEBOOK EVANGELISM, which he started in October, 2013. Brother Jack is a lecturer at the Redeemed Christian Church of God, Bible College, Amen Tower Campus. He is the Technologist in charge of the Public Relations and Advertising Studio, Nigerian Institute of journalism (NIJ) where he is also a lecturer and was part of the team that worked towards the reopening and subsequent licensing of the institution after a five year closure due to non-accreditation. He was a member of the team that helped secure NIJ’s accreditation for: NATIONAL BOARD FOR TECHNICAL EDUCATION ACCREDITATION FOR HND MASS COMMUNICATION and NATIONAL BOARD FOR TECHNICAL EDUCATION ACCREDITATION FOR ND MASS COMMUNICATION. He designed the graphic studio manual for the PR/Advertising studio in 2005 and revised it in 2010. Jack obtained a Bachelor of Arts in Fine and Applied Arts, from the UNIVERSITY OF NIGERIA, NSUKKA, in 1991. Over the past five years, he has been involved in a divinely-inspired, self-motivated and self-financed research on the subject of STRATEGY. His work in progress is SYSTEMS THEORY OF STRATEGY. The foreword to the maiden edition of our publication, HIERARCHY MAGAZINE, is written by The President, Nigerian Guild of Editors, Femi Adesina. We will also launch our published e-book and audio-book, LEADERSHIP ETHICS.